Access to the e-Edition can be purchased for 6, 12 or 24 months as one time payment. The subscription automatically ends with the expiration of the selected duration. Payment is via PayPal or credit card. 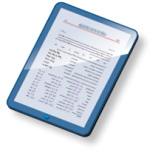 Check out our Sample Lesson and see for yourself the benefits of e-Edition. With your free registration, you will receive access to selected lessons of the e-Edition.